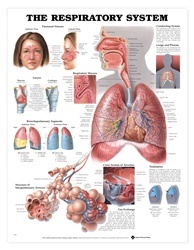 Illustrates the respiratory system from the frontal sinus to the diaphragm. Includes views of the paranasal sinuses, larynx, and bronchopulmonary segments. Also shows the structure of intrapulmonary airways and the cross section of alveolus. Discusses the conducting system, lungs and pleurae, ventilation and gas exchange.